To me, it was just our planet desperately trying to survive by kicking us out. (SPOILERS) Here’s the reason most original Netflix movies don’t gain much traction: they’re forgettable, bland, cheap filler. There’s nothing very awful about Io: Last on Earth, so there’s that, but neither is there any reason to stay the course with it, except out of loyalty to the principal of finishing what you’ve started. I’m wondering if Netflix decided it would be best to add the subtitle to Ioon the basis that shouldn’t totally diddle your audience. If you’re watching a movie called The Invisible Man, you can reasonably except to see, so to speak, an invisible man. In Io, we don’t visit Io, where most of the surviving humanity has buggered off, to live in an orbiting space station. So, even if our protagonists hadmade it into space, it’s very unlikely they’d have visited the titular moon itself. You’ll have to watch Outland for that. In fact, watch Outland instead. It’s no forgotten classic, but it is very watchable – it’s Sean Connery! – and you won’t fall asleep halfway through. 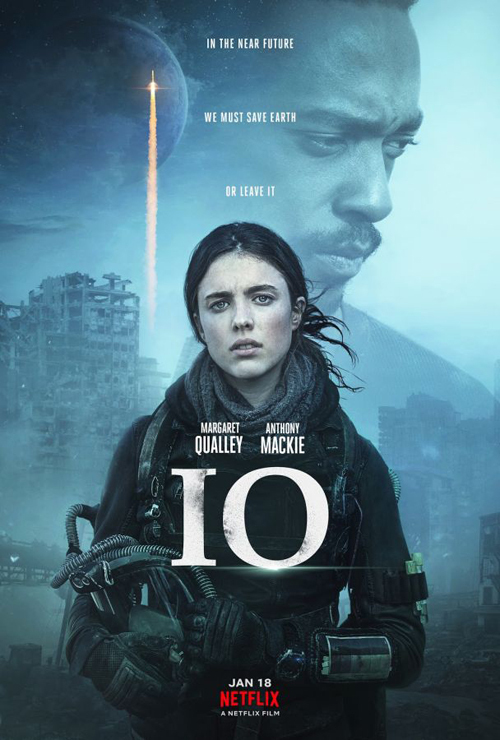 The first half hour of Io consists of Margaret Qualley (The Leftovers) on her own in an oxygen mask checking for signs of life adapting to Earth’s toxic environment. That’s when she isn’t in her high-altitude, last-vestige home, messing with bees and growing veg. So far so soporific. The arrival of Anthony Mackie in a helium balloon might have been an opportunity to energise the situation, but Mackie’s trying his best to show what a serious actor he can be when he’s not cracking wise, so no joy there. And the prospect of Danny Huston joining them is swiftly dashed when we learn he’s snuffed it (the reason Mackie decided to visit in the first place; "I thought we could find a way for humans to survive on Earth. We were wrong"). Naturally, a romance ensues; I’ve seen comparisons made with Z for Zachariah, but that’s an entirely superior movie. It has conflict for a start (a love triangle), and chemistry between its stars, and simply an altogether more involving plot. About the only glimmer of interest in the movie occurs at the very end, where having decided to depart for Io, they need to stock up on helium supplies from a nearby city. When Sam’s oxygen runs out, she takes off her helmet, the suggestion being – unless she’s dead and this is a fantasy sequence – that, like her miraculous queen bee, she survives and has developed an immunity; the final shot finds her on a beach with their child (Micah, not being immune, has headed to Io). It’s not really that interesting, though. Not enough to justify ninety-plus minutes of lead-in. Director Jonathan Helpert does a competent job, contrasting decaying city environments with the solace of geodesic domes atop a mountain, but he fails with the most important part of what is essentially a chamber piece: the characters. Although, the three credited screenwriters must also take a sizeable portion of the blame for coming up with something so inert.